Before the play even starts, the audience is surrounded by an air of mystery and foreboding. Eerie music and muted lighting prefaces the account of the tragic tale of Medea. Three ephemeral women linger in the balcony, observing and praying. The serene nurse, played by Siobhan Brown, explains how after her husband decided to take a new wife, Medea is going to be exiled from Corinth with her sons. Brown plays a gentle, loyal, grounded woman who serves and supports her mistress. Jennie Israel’s Medea is neither wild nor insane; she is a smart woman who has been used by her husband Jason (Nigel Gore) for his success and then cast aside when he has the opportunity to rise in status by marrying King Creon’s daughter. Israel’s strength comes not through force, but through intelligence. Her performance gives Jason and Creon reason to fear because she has not been driven mad, but she swings between almost calm and rational to extreme depression. She struggles between her own reason and anger. Her realistic portrayal leaves open the question of who is at fault and if she had a choice in her reaction. Jason, played by Nigel Gore, adopts a logical position regarding his marriage to the princess. He says he was trying to raise not only his own fortune, but also the fortunes Medea and their sons. He chides Medea for her “irrational” anger and blames her for her own exile. While Jason’s reasoning might be relatively sound in a “civilized” society, Euripides permits the audience to question what it civil. Medea was educated and gave up everything (including her own family) to be with Jason; can she be blamed for being upset at being cast aside–even if the motives were “reasonable” and for the betterment of the family? Medea’s sons (Adam Freeman and Jackson Wagner) seem indifferent or unaware of the conflict between their parents. This attitude validates some of Medea’s concerns that her husband’s influence in the boy’s lives. In addition, their actions are similar to their father’s and that could lead to their potential betrayal. The Corinthian women (McCaela Donovan, Obehi Janice, and Sarah Newhouse) speak for the women in Corinthian society. Creon and Jason’s actions are to be expected; the men’s “businesslike” conduct is normal and should not be challenged. Women are expected to submit to their husbands regardless of their actions. 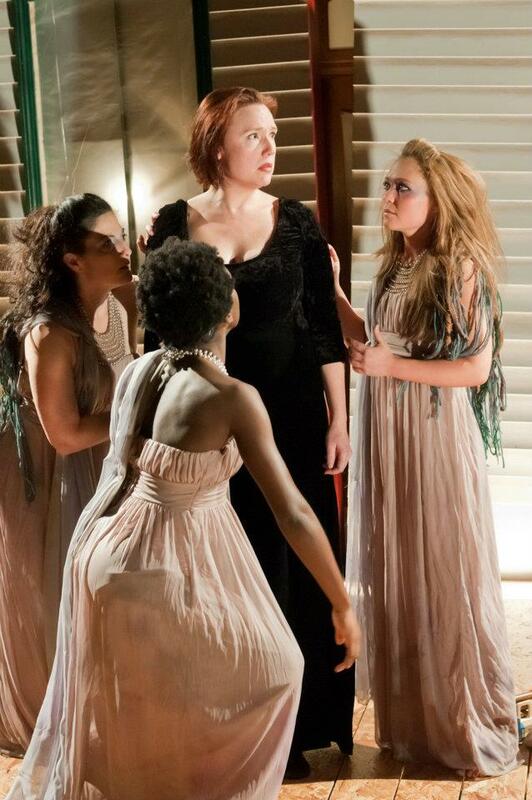 David R. Gammon’s staging and Susan Dibble’s choreography connect the women’s plight to Medea’s actions. Medea’s crime could cause repercussions in the community and encourage more abuse between the men and the women in Corinth. Actors’ Shakespeare Project’s production of Medea provides a truly human struggle that is not unlike “true crime” accounts of our present day. One wonders what will happen to Medea and Jason. Nothing is clearly resolved (unlike a Shakespearean tragedy where the main characters die). The consequences of their actions are still to be weighed. Is Medea simply a heartless witch? Are Jason’s argument rational and reasonable? Are Medea’s reactions wrong? Like many crime accounts of our day, Euripides does not make it easy to draw conclusions. This story turns our eyes on our own society and our own values and leaves us with arguments and questions to be debated long into the future. This entry was posted in Drama and tagged 2012, Actor's Shakespeare Project, anger, Cambridge, Corinth, crime drama, emotion, Euripides, February, feminism, Greece, human, law and order, logic, MA, March, Medea, Multicultural Arts Center, realistic, reason, revenge by beccackidwell. Bookmark the permalink.